Martin thus became the first person to call from a mobile phone. Commercial point of view, however, took 10 years to become practical mobile phone. The sheer simplicity of the journey that began with mobile phone watch - watch Arbhon have changed people's lives. 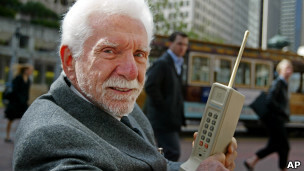 He demonstrated by first Motorola mobile phone in New York and Washington have proved that it is possible to keep personal mobile phone. Martin said that the mobile phone can prove to be quite beneficial for humanity. He said, "If a person is connected with the rest of the world can be so many things. For me the most exciting medical revolution, because today we have the ability to find out about their bodies. " In response to a question, he said the mobile service provider companies focus on speed rather than network coverage. Such techniques are available today that can provide reliable coverage and can increase system capacity, but the slow pace of adoption. How to send Self-destructing emails ?